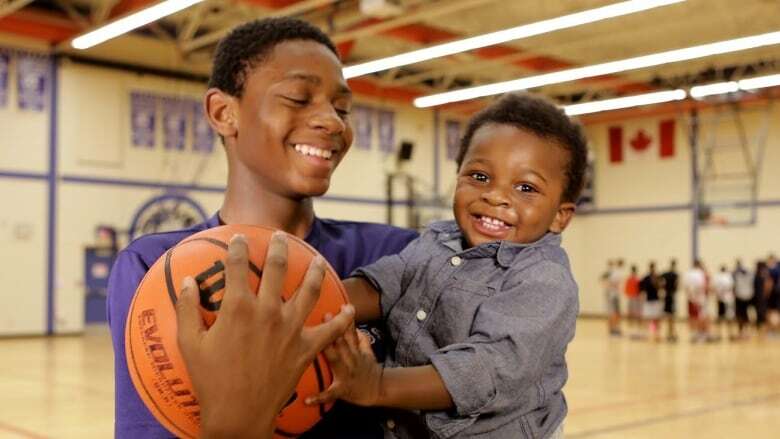 What are the goals of the best 13-year-old basketball player in North America? Attend college, go to the NBA, make millions of dollars, and buy a massive mansion for his entire family. As the final bell rings at Crestwood Preparatory College in Toronto, most students rush home to begin their highly anticipated March break. But not Elijah Fisher. Fisher heads straight to the gym, where a prominent NBA trainer is waiting for him. Fisher is 13 years old. He's six feet five inches, wears size 16 shoes, and he can dunk with ease. According to many professional scouts, he's the top North American player that will graduate in the class of 2023. Coach Ro Russell, who's been training Fisher, is in awe of his talent. "He has a passion like I've never seen before, where he wants to be the best ever at whatever he does. He's ranked the number one player in North America for basketball. Basically that means he's the number one 13-year-old in the world. Our goal is for him to be the best player to come out of Canada." With those expectations, there's simply no room to be an average teenager. When Fisher is not in the classroom or doing schoolwork, he's on the basketball court. If he's not practicing, he's playing in a game against kids that are often six or seven years older than him. "Basketball gave me a lot because I would have still been a kid going to my old public school. Go home, not do my homework, sleep, play video games. Now that I know I can do something with basketball, it's changing me," said Fisher. At times, that kind of mentality worries his mother, Thelia. "I worry sometimes, because he doesn't do the normal stuff that teenagers do. He doesn't get to go to the mall with his friends, and do the sleepover stuff. I've never heard him say, 'I just want to chill.' It's always basketball, basketball, basketball. Is he losing something because he's not able to do the stuff that I think a normal 13-year-old should do?" But for Fisher, basketball is more than just a game. There's a much deeper motivation for sacrificing his childhood. "I put a lot of pressure on myself to do well because I don't want to put all the pressure on my parents. I have four brothers, and it's a lot of college fees to be paying. I want to change that. I want to get a free education so I can help my brothers out, and put less stress on my Mom and Dad's back." Even though Fisher's parents constantly reassure their teenage son that none of that matters, no one can talk him out of chasing his dreams. "When I'm on the basketball court, I think about providing for them. I think about that a lot. When I lay down at night, and I see later on in my life, I see me in college, then going to the NBA, making a lot of money to help my brothers out and everything. I want my brothers to look up to me in a good way."